Cigniti’s ERP testing practice offers a full suite of integrated ERP testing services across the lifecycle of ERP projects – Implementation, Upgrade, Rollout, Production Support, and Maintenance. Our comprehensive testing strategy, domain expertise and extensive experience in delivering ERP testing projects for global clients enables us to make your testing more effective, achieve better quality, and reduce cycle times. Cigniti’s ERP Test Accelerator kit also ensures rapid results by reducing the overall testing time, cost, and risk. Cigniti’s ERP CoE team of 300+ ERP Testers are specialized in leading ERP products, possess strong functional, domain, and technical knowledge, and are competent in covering all facets of ERP quality assurance and testing—from advisory services through test execution. Cigniti’s ERP CoE suite has a repository of customized pre-built test accelerators for 3000+ manual test cases, 2000+ automated test scripts, well-defined test data management processes, and robust test automation frameworks for leading ERP platforms. Cigniti’s SAP testing practice provides cost-effective testing solutions that address all aspects of SAP implementation and upgrade methodologies. Our SAP experts work with clients to develop custom testing solutions that help them maximize returns from SAP investments, and accelerate time to value with SAP test accelerators in the form of a pre-built test suite for standard SAP business processes and out-of-the-box SAP functionalities. In addition to test accelerators, Cigniti has also built ready to use test automation frameworks. Cigniti’s business-driven and structured Oracle testing approach enables clients to achieve the highest quality Oracle application deployments, with less cost and faster time to market. Our expertise spans across end-to-end functional & regression testing for SCM, Service Contracts, Finance, HRMS, Procurement and Manufacturing modules delivered by a team of Oracle testing experts that have extensive large scale Oracle EBS implementation testing expertise. Cigniti’s Oracle testing practice has built a suite of test accelerators covering 1500+ Oracle functional scenarios. 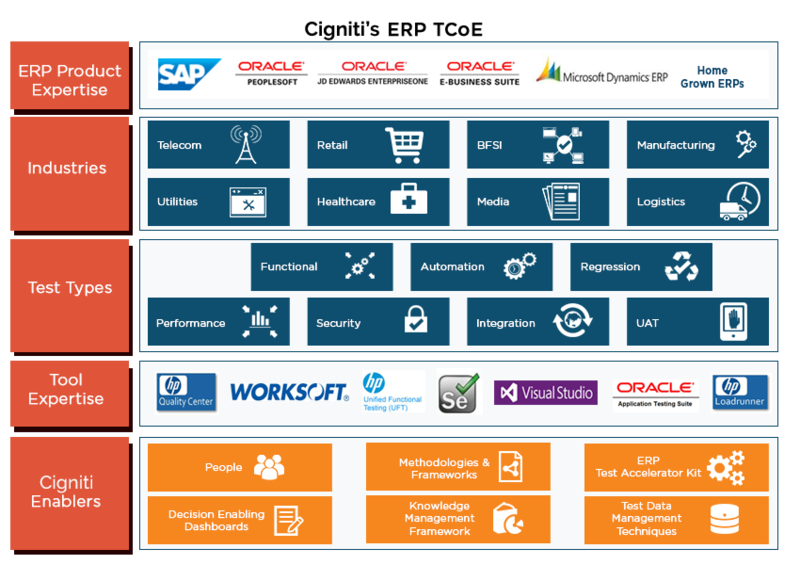 Cigniti experts have also built a Test Automation Framework customized for testing Oracle ERP systems. Cigniti’s PeopleSoft testing specialists provide a wide range of testing services spread across various modules of PeopleSoft covering all aspects of business operations. We enable organizations to enhance productivity, accelerate performance and thus deliver greater ROI from the PeopleSoft implementations. Cigniti’s PeopleSoft practice provides end-to-end functional & regression testing for PeopleSoft modules such as HCM, FSCM, CRM, ELM and CS, and has built strong IP in the form of pre-packaged solutions covering 400 automated test scenarios for PeopleSoft modules like Core HR, NAP (North American Payroll), E-Module, and Finance modules. Cigniti’s MS Dynamics Testing CoE comprises over 50+ career testers with experience in testing Dynamics AX and CRM implementations, integrations, and enhancements across various modules like Financial Management, Services Management, HR Management, Supply Chain Management, Sales and Marketing, BI and Reporting. With in-depth knowledge of Microsoft Dynamics CRM and Test Procedures & Microsoft Test tools, Cigniti’s MS Dynamics practice is adept at handling any customizations, localizations, and core CRM with a good understanding of business processes. Over the past 10+ years, our test team has built considerable technical expertise and experience of handling various testing tools & processes to address MS Dynamics testing requirements. Cigniti’s MS Dynamics experts have also built a test automation kit with over 800 manual and automation test assets that help jump-start testing efforts. Cigniti’s Salesforce test experts conduct comprehensive testing that includes functional testing, load testing, and security testing aligned with the business requirements. Cigniti’s IP-led Test Automation Framework for Salesforce is a proven framework encompassing 90+ function libraries that help jumpstart testing for Salesforce implementations. Every enterprise workflow is different; thus, Cigniti’s Hybrid Test Automation Framework is built to deliver the agility that clients need for Salesforce CRM implementations. Cigniti’s Workday testing specialists provide a wide range of testing services that address QA requirements from implementation to post-deployment including automated testing services to help clients keep their Workday configuration reliable and secure. Cigniti has built robust IP to help jumpstart end-to-end Business process & integration testing efforts with a repository of pre-built & custom test cases. Can PeopleSoft ERP Testing & Performance Testing Enable the Hospitality Sector? 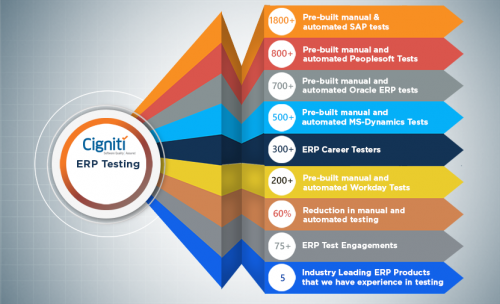 Cigniti has partnered with various tool vendors to automate the ERP testing needs of businesses. This helps us offer additional value to our clients across verticals. With the right mix of Commercial and Open source tools, we bring in the best possible solution to give you a robust test environment for your ERP. Cigniti’s ERP test experts have successfully helped organizations to get the best out of their ERP. Our clients have realized the true benefits and an uninterrupted flow while working with various modules of ERP. Cigniti’s ERP CoE and end-to-end testing framework for ERP have enabled numerous clients to ensure the quality of development and maintenance of their ERP platform.